Although it looks beautifully complex this light appetizer is deceptively simple, with only four ingredients. The key ingredient here is the tomato water. Made by extracting the liquid from tomatoes without any of the solids, you get a clear yellow broth that has a bright clean umami and beautifully balanced sweetness and acidity. 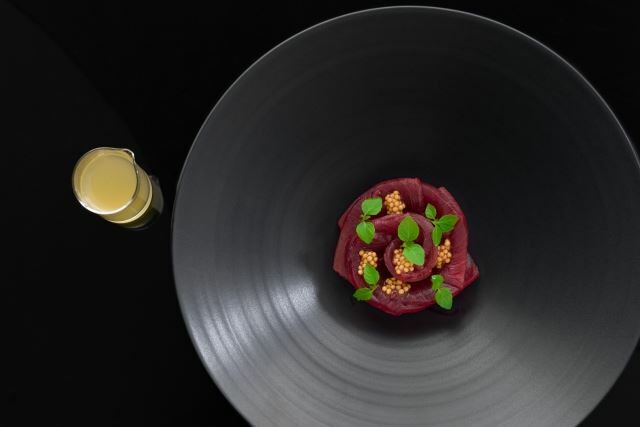 By thinly slicing and rolling the bigeye tuna into a flower, it not only makes for a visually stunning plate, the "petals" help hold the mustard seeds and micro-shiso in place after you've covered everything in tomato water. This easy noodle dish comes together in no time, and yet it showcases a complex medley of flavors that embodies an exotic sophistication. 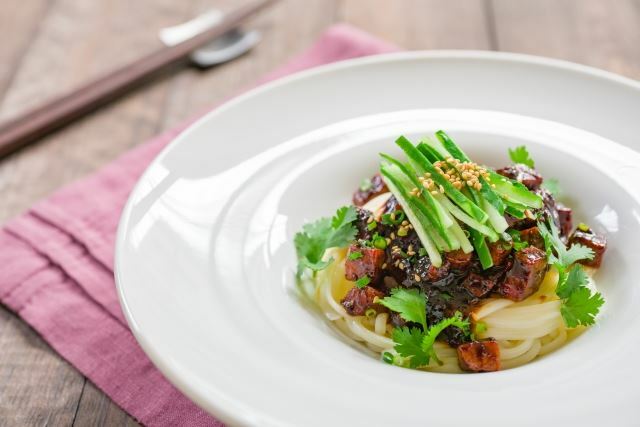 With fresh Yellowfin tuna stir fried with caramelized garlic and ginger and a sweet and spicy sauce made from tianmianjiang (sweet bean sauce), it's served over a bed of slippery al-dente noodles that are redolent of toasted sesame. Topped with crisp julienned cucumbers and fragrant cilantro, each bite features a new combination of textures, temperatures and tastes. Dinner parties can be hectic in the kitchen which is why simple canapes that exude elegance are the best. 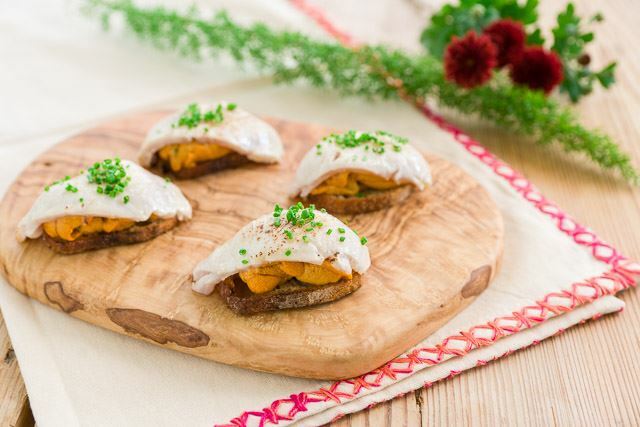 These crisp crostini are topped with a mound of velvety sweet uni and draped with a thin sheet of Ivory King Salmon. The salmon is so laden with fat that when it’s briefly torched, the fat melts like butter, turning each bite into a blissful pool of creamy brine against the crisp bread. The best part is that you can toast the bread and slice the salmon ahead of time so that all you need to do is assemble and torch these tiny treats. 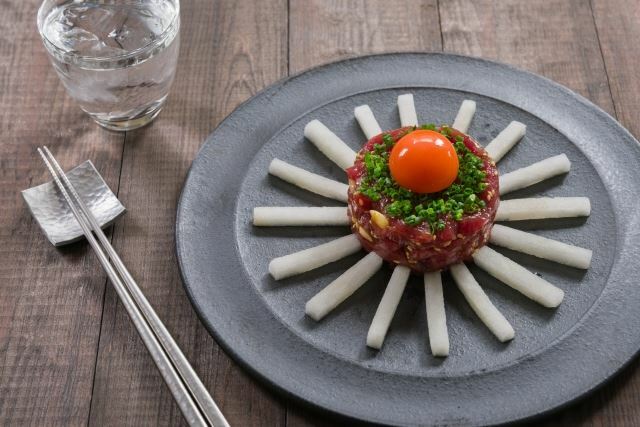 This classic Korean tartare is usually made with beef, but our Bluefin Tuna is an equally tasty alternative. 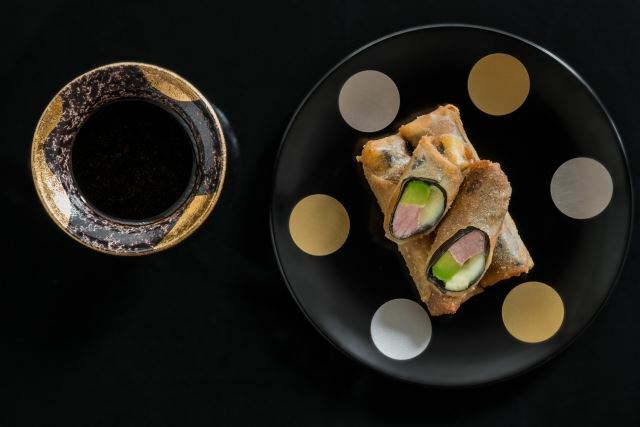 The tuna is cut into strips and seasoned with soy sauce, sesame oil and garlic and mixed with pine nuts and sesame seeds. It's topped with chives and a raw egg yolk that get mixed in for a rich, flavorful appetizer that goes beautifully with sweet crispy sticks of Asian pear. When eating uncooked or undercooked egg, please be sure your eggs are pasteurized.